The Kingswood neighborhood is located in the city of Athens, Georgia – at the western edge of Clarke County, just across the Oconee County line, inside the Route 10 perimeter loop. 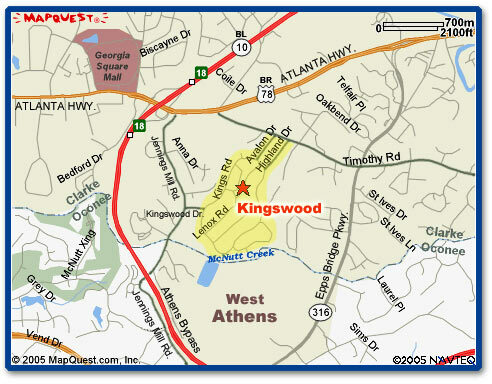 The main access to Kingswood is off Timothy Road at two eastern entrances at Avalon Drive and Highland Drive – across from Timothy Road Elementary School (south of Atlanta Highway) – and a western entrance off Jennings Mill Road at Kingswood Drive. Brick entrance markers distinguish all three of our entrances — two off Timothy Road on the east and a third off Jennings Mill Road on the west. These entrances are decorated to commemorate the holidays. The entrance to the Kings Ridge subdivision is also located within Kingswood, off Kingswood’s Kings Road perimeter loop at Lenox Road. These neighbors use our three entrances as well. 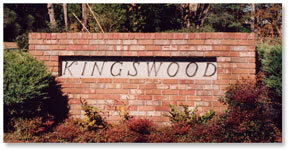 Kingswood was established in 1967, with most of the original homes built by 1979. The most recent houses built were three new homes, on the north side of Tuxedo Road, constructed in 2004 and 2005. Once a neighborhood “way out west,” Kingswood is now conveniently surrounded by all necessary services, including malls, grocery stores, restaurants, home supply stores, and much more. Our zip code is 30606. We are located in ACC Commission District 10. Our polling place is at TRES (Timothy Road Elementary School). TRES, our neighborhood school, is one of the top elementary schools in our school district and feeds Clarke Middle School and Clarke Central High School. Our tree-lines streets are very popular with joggers, walkers, bikers, and baby carriages. 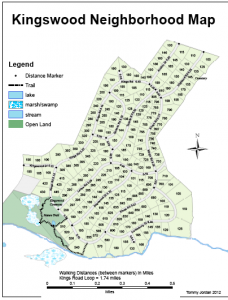 In addition, our woodland – across from Kingswood Commons – features a trail through the forest.